Interesting images! Got to love MSW updates and spoilers. On a side note, while I feel the Cobb Vanth theory is cool and has potential, personally I’m hoping that “The Mandalorian” is actually about a lone Mando gone rogue rather than someone in Mandalorian armor. 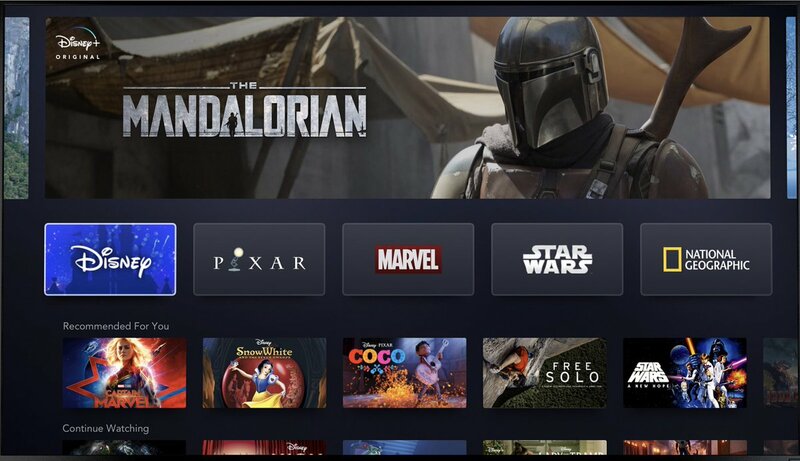 Otherwise why call the show “The Mandalorian”? Of course, even if Vanth does end up being the central character, what if the storyline also dives into the history of the armor before Vanth obtained it (if it’s not Boba Fett’s)? Sabine Wren did say, in Rebels, that Mandalorian armor is very important to its owner and that it has its own history written in the blood and battles of the warriors that came before. Hello there! Thanks for sharing, I hope we find out something official soon. I'm obviously excited for this new show to be about Cobb Vanth - but I'm not going to get too excited until I know something official! 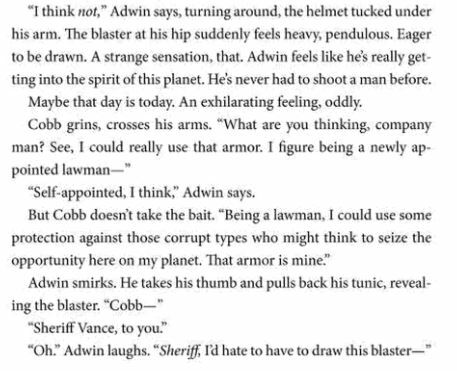 'the Mandalorian' can be a name given to Cobb Vanth because of the Mandalorian armor - the people he helps may not know who he is, and he may not tell them.. so he may simply be referred to by the society as 'The Mandalorian'. If the premise of the series is a main character who has liberated himself from slavery, and chosen to take on the crime syndicates head on and help others who need him - I think this is a character I can really cheer for.. and it feeds into one of the main themes of star wars - that characters make choices, and can choose to fight for their world and their community and be selfless and help others. This character would exemplify the light side of the force - a life lived in service of others.. I can imagine a character like Cobb Vanth becoming a legend throughout the galaxy and an inspiration to others who are enslaved and wish to rise up and take back their communities and their lives. In a similar way to the Jedi being held up as a beacon of hope (like at the end of TLJ), people like Cobb Vanth and Han Solo are inspirational in a different way - because they are not gifted with force powers, and yet they still make choices to make the galaxy better, and still achieve great things. They are heroic with what they have. Whoooooo this has got me thinking about IX! I'm going to head over the predictions thread to explore this further. Agreed, well stated! Cobb Vanth’s story definitely plays into the larger themes of Star Wars. He has that Han Solo/Jyn Erso potential. I’m curious about his past though. 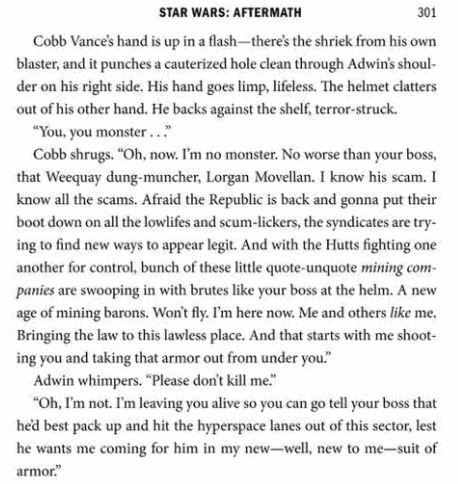 I re-read the passage in the Aftermath novel when Vanth discovered the Mando armor in the Jawas possession. He seemed to know something about it, as if it had a deeper meaning for him. Maybe it was a piece of home? Could he actually be Mandalorian? When the Black Sun helped Maul and the Death Watch take over Mandalore, I’m sure many New Mandalorians were taken prisoner and even sold into slavery. Could this have happened to Vanth? After all the Black Sun’s symbol is a black star. Not unlike the branding carved into Cobb’s back. Even if he’s not a Mando, like you said, it’s the legend of what the armor represents that lives on. It becomes a symbol of hope to the inhabitants of Freetown, regardless of its wearer’s origin. 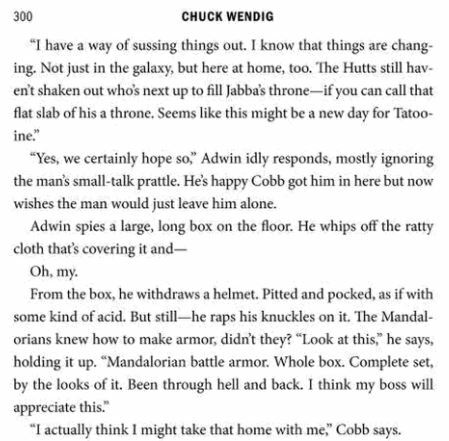 @TheBastardofMandalore - intersting idea about Cobb Vanth being a slave whose origin is Mandalore. That is possible because we don't know much about him. I didn't pick up on any recognition with the armor. I had a look at the section of the book - I think this is the first time we meet Cobb Vanth. I got the impression it was the other guy who recognised it as Mandalorian, there is no indication Cobb Vanth knew it was Mandalorian (but that doesn't mean he doesn't either!) - I got the impression he saw it's immediate value, it's a valuable tool to fight the fight he wants to fight. I forgot the book mentioned the acid. whoa! like what we'd find in a Sarlacc belly perhaps? I gotta read this trilogy again! Shoot first, talk later - sounds just like something Han Solo would say! @TheBastardofMandalore wrote: ...Even if he’s not a Mando, like you said, it’s the legend of what the armor represents that lives on. It becomes a symbol of hope to the inhabitants of Freetown, regardless of its wearer’s origin. @TheBastardofMandalore - I love this!! @“Starliteprism” - thanks for sharing! ‘Lone mandalorian gunfighter’ is the first official mention that the main character is actually mandalorian! And it’s not just based on using Mandalorian armor! I can’t wait- this is gonna be great!! Rumour that Sabine Wren's helmet is being used for testing a new tech in special effects, so hints at the idea she might make an appearance. Dave Filoni is directing a couple of episodes, so could be a possibility. Considering The Star Wars Show is officially on Holiday hiatus, and they posted this yesterday as breaking news...I though it worthy of a post. I was recently discussing the Mando’s costume and how it changes over the course of the series. A source asked me if I was aware that his suit uses Scarif Trooper parts, and I was. The source then asked if I was aware that as the story goes on he ends up with Death Troopers parts, which I was not aware. I asked if the pieces are black and they responded that the costume moves towards a chrome look like the helmet we’ve seen in the first photo released of him. I didn’t really get my question answered there but it does seem like the costume evolves from what we’ve seen so far into something more up-designed. Supposedly there is a secret enclave of Mandalorians our hero is affiliated with. It is in this enclave that an armorer resides. It appears this woman is the key to his major upgrades. It almost sounds like she’s Q from James Bond for our hero, but I might be overstepping with that comparison. It isn’t clear how much of the costume is older Mandalorian armor and how much are parts he’s acquired in his adventures or misadventures especially as the story moves on. But I did see him fighting a lot of Death Troopers and I’m assuming that’s where he gets those pieces. That is kind of cool when you think about it as the Empire is dying post Return of the Jedi and the Rogue One Death Troopers are about to be a thing of the past that he carries into that new era. It also sounds like that enclave is going to be really inspiring for future Star Wars content. I keep hearing that there is a lot of Mandalorian culture building through this enclave in the series. As his armor is upgraded through about five stages, we learn things about Mando culture. It isn’t clear if it goes beyond what we know from The Clone Wars and Rebels but I’m guessing some of that will be reiterated and developed in the series. My gosh, Twitter is on fire today. 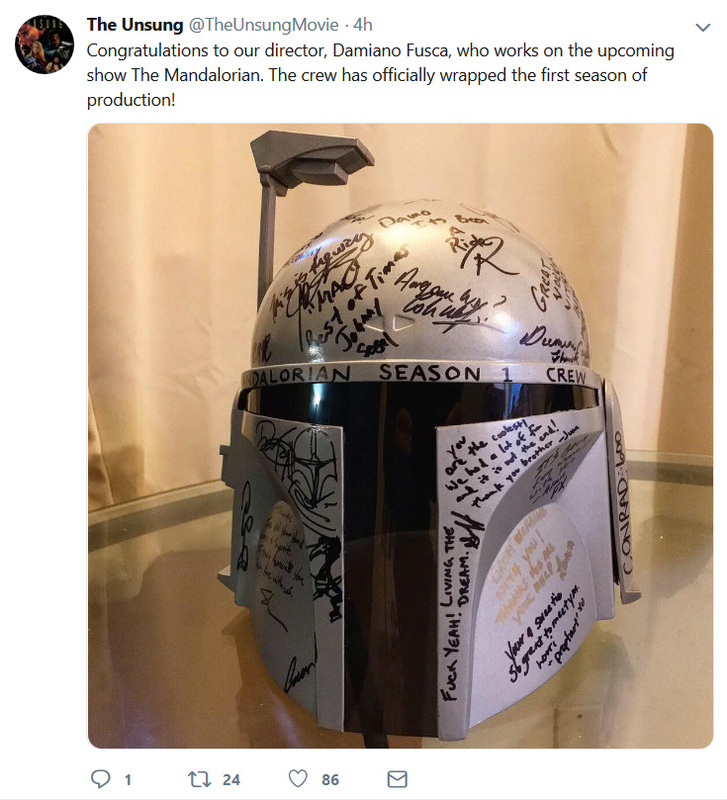 Mandalorian season 1 wraps filming the same day as IX? Did they plan this? Not sure how reliable this site is but they are an entertainment company . Bob Iger showed the logo of the serie when he presented the future catalogue of Disney+. Maybe you should change the title of the topic with the name of the serie to prepare for the Celebration's announcements. @LadyGaufrette wrote: Bob Iger showed the logo of the serie when he presented the future catalogue of Disney+. It looks amazing and loved that the cast were so excited and happy to be part of it . The mandalorian’s costume looks so bad*** and as Pedro Pascal ( the lead ) said it’s got medieval influences on it in design . Am glad they made this as we’ve seen nothing of Mandalorian culture or civilisation in the films and it will be nice to see that referenced . Do you know where I could see these leaked bits? Loved Jon & Dave together they have great chemistry. Pascal sounds hot with mask! @rey09 @AhsokaTano - thanks for sharing it looks awesome!!!!! @spacebaby45678 - love your sig! @DeeBee wrote: @rey09 @AhsokaTano - thanks for sharing it looks awesome!!!! !